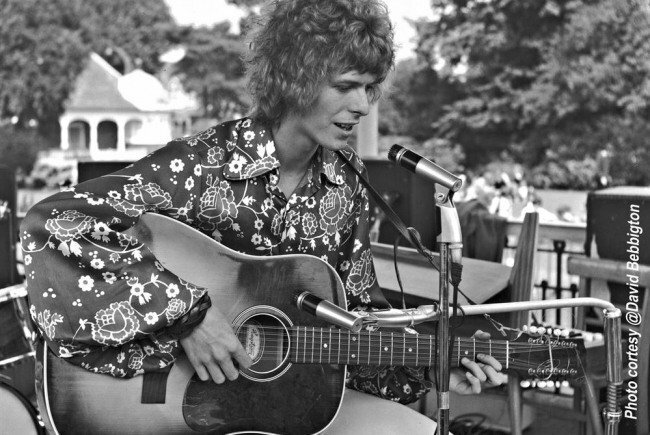 Bromley Council have agreed to submit a grant application for up to £89,000 to the Heritage Lottery Fund as it looks to help get the Bowie Bandstand restoration project off the ground. The remainder of the £245,000 total needed will come from ‘match-funding’ including through Bandstand Brick sales and other community fundraising activities including the Bowie Beckenham Oddity festivals. The iconic Edwardian bandstand – located in Croydon Road Recreation Ground – is where David Bowie and friends from the Beckenham Arts Lab held the UK’s first Free Festival – The Growth Summer Festival – on August 16, 49 years ago. The festival coincided with the release of Bowie’s first hit single Space Oddity and the day was later immortalised with another Bowie single release, Memory Of A Free Festival. A specialist structural survey carried out November 2013 identified that the condition of the bandstand was deteriorating. Significant repair works are needed to prevent further decline, which could ultimately result in removal the asset if not remedied. The restoration project will not only refurbish the existing bandstand but also include the purchase of temporary staging and installation of a suitable flat base which have been incorporated into the design to maximise the space on offer and increase the variety and number of groups using the bandstand. A previous grant application in 2015 was unsuccessful but following a community consultation which demonstrated “significant local support” for the restoration activities, the council have since decided to resubmit an application. Should the grant application be successful, it is anticipated that the project will commence March 2019 once grant contracts have been signed. Councillor William Huntington-Thresher, executive councillor for environment and community services, said: “The council continues with its long held aspiration to restore this much loved historic bandstand, where David Bowie famously performed as his career was taking off. “I would like to thank all those who have shown their support in so many ways, including the organisers of the recent Memory of a Free Festival concert, everyone who has purchased a bandstand brick and of course, the Friends of Bec. Be the first to comment on "Council to submit Bowie Bandstand grant application"